What is involved in fitting out a rebound therapy room? Continental manufactures trampolines, wall padding, podiums and cushioned flooring and is therefore ideally placed to provide a complete fit-out service for your rebound therapy room. What type of trampoline is installed? Bespoke trampoline - a bespoke solution to suit the size of your room. Normally used in rooms that cannot accomodate a 77 size trampoline. We install a special metal frame fixed to the walls of a recess. But please be aware that the absolute minimum size of bed for a recessed trampoline approved by the Rebound Therapy Organisation is 2,900mm x 1,300mm which requires an absolute minimum pit size of 3,510mm x 1,910mm x 750mm. What type of bed is best for rebound therapy? We recommend Continental's own "UltraMesh" beds for rebound therapy which is a material and bed design we developed specifically in conjunction with ReboundTherapy.org - they are high-grip, wipe clean and are available in grey, red, blue or green colours. We make standard size UltraMesh beds to suit a 77 trampoline and we manufacture bespoke UltraMesh beds for bespoke trampolines. Please note that the widest UltraMesh bed we can make is 1,950mm (to suit a pit 2,560mm wide). For larger bed areas such as for a 99 trampoline we recommend a 13mm wide nylon web bed. What coverall padding is provided on the trampoline? The trampoline is provided without standard coverall pads, but instead specially extended coverall pads are manufactured to suit the room that extend over the springs and frame and onto the surrounding floor. Do I need a recessed pit or a raised podium? A recessed pit - a below floor level hole in the ground into which a standard trampoline is lowered or to which a bespoke trampoline is fixed. This is the preferred method as it allows easy floor level access onto the trampoline bed. A raised podium - an above the floor metal and timber construction with steps up to it to provide a raised platform around the trampoline. If you cannot create a recess in your room, then subject to ceiling height we can create a podium style raised "recess" to accomodate the trampoline - this can include padded balustrades, padded steps etc. to suit your requirements - see example images above. With this arrangement it is important to consider clear height above the trampoline and how users will access the raised area. A movable pit system - for rooms that will be multi-purpose we can provide a system with a floor covering that allows the room to be used as say an assembly hall or a sports hall which then lifts out of the way using an electrically operated under floor system to expose the trampoline - see here for more details of this system. What do you put on the walls? For areas where there is a risk of a user or carer coming into accidental contact with a wall we recommend wall padding is installed. We manufacture removable PVC covered padded wall panels that are fixed to the walls using timber bearers and velcro (panels must be easily removable in the event of accidents / damage). Some customers continue that padding for aesthetic consistency to all walls even when the risk of contact is negligible. The PVC used for coveralls and wall padding is washable and is available in a range of stock colours (blue, red, green, yellow, jade, white) and a huge range of some 23 "special" colours. As an alternative we can provide PVC covered foam matting on the floor but please note that it is harder (or impossible) to move wheelchairs on such a surface. What about harnesses and hoists? We do not supply or install those but we have supply chain partners who can offer those items to suit your requirements as part of a turnkey solution. 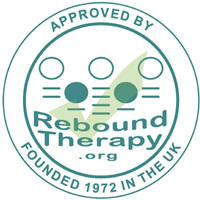 Please contact us for a quotation for a complete fit-out of your rebound therapy room. We need the dimensions of the room and door locations - and ideally a decision on whether you will provide a recess below floor level or if you want us to create a raised podium - and we can make a proposal for the rest. We can provide 3D simulations of the finished room so you can ensure it meets your requirements. Please also refer to the Rebound Therapy Association for more assistance. Minimum trampoline size: The absolute minimum bed size for a recessed trampoline approved by the Rebound Therapy Organisation is 2,900mm x 1,300mm x 750mm deep which requires a pit size of 3,510mm x 1,910mm. Bed type restriction: The preferred bed type for rebound therapy is UltraMesh. The widest we can manufacture an UltraMesh bed is 1,950mm (with no restriction on length). For beds between 1,950mm and 2,140mm wide we can manufacture web beds and for beds wider than 2,140mm we can use Permatron up to 3.5m wide. There is no restriction on the length of an UltraMesh bed or Permatron bed, but web beds can be a maximum of 4,280mm long.